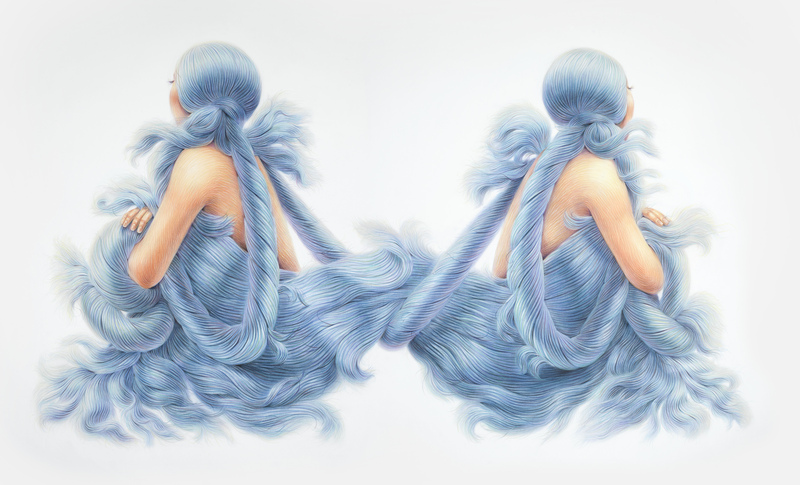 Twisted and entangled in endless, flowing locks, artist Winnie Truong’s figures seem to sprout waves of hair from every part of them, including their eyes. 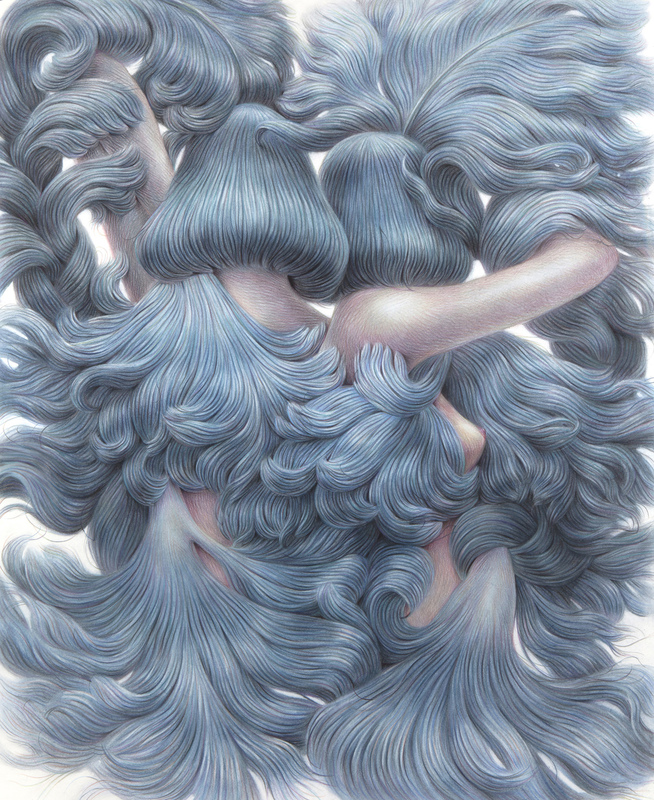 What is so unusual about the women in her work is that even their skin seems to exhibit the delicate texture of hair, giving an element of subtle movement to their bodies. 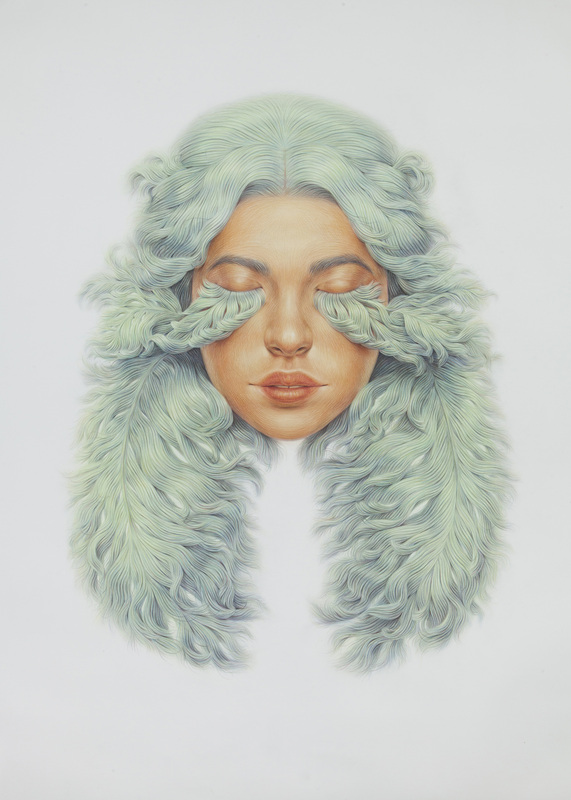 Line being a vital component in her compositions, Truong uses color pencil and chalk to meticulously render every strand of hair, carefully giving attention to every detail. 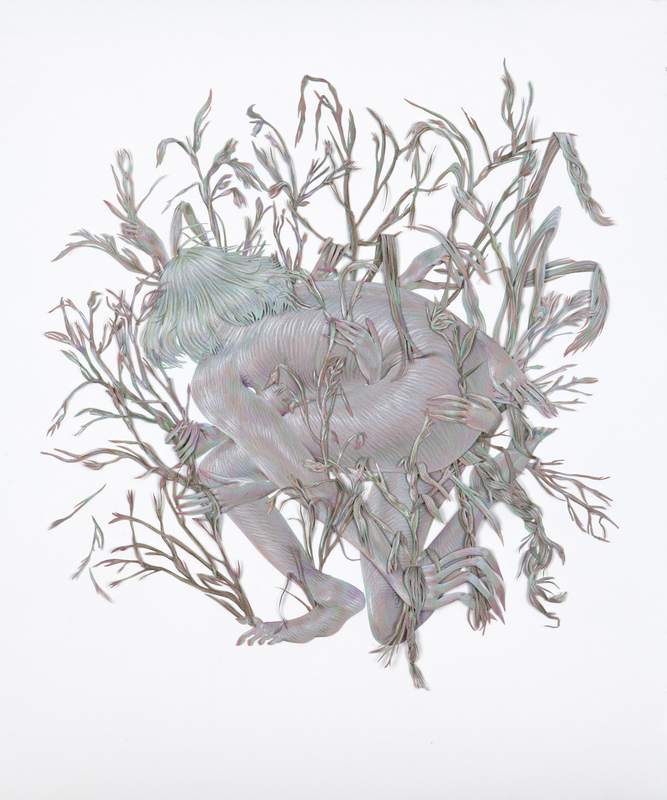 Experimenting with a new medium, her most recent work uses cut paper to create female figures engulfed in wild weeds, twigs, and vines, which become intertwined into their massive sheets of hair until you can no longer see where the figure begins and nature ends. 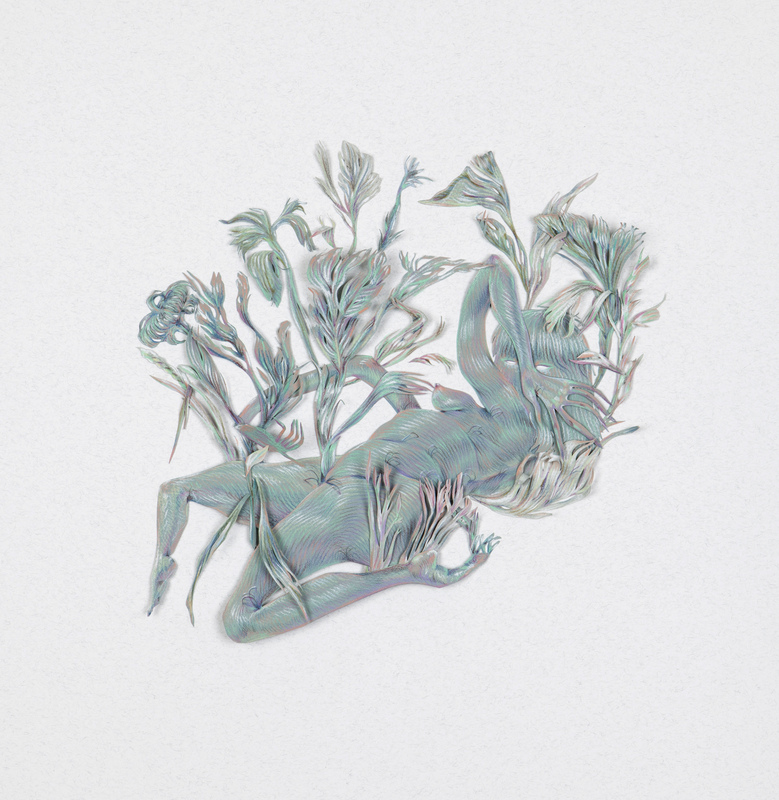 Flower stalks become strange extensions of the body as they travel out from the figures’ hands and limbs. 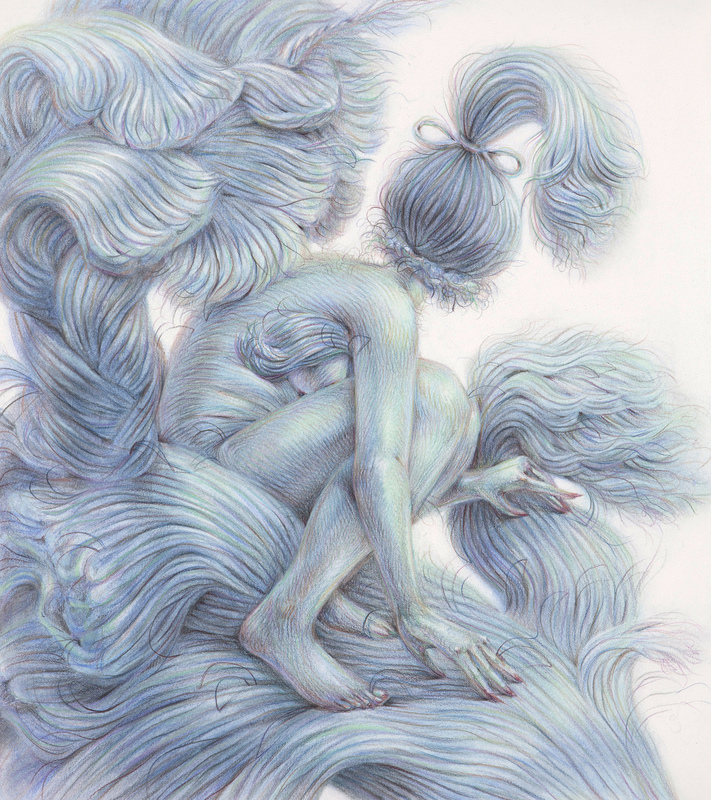 Truong’s next artistic venture is moving her drawings into the realm of animation. 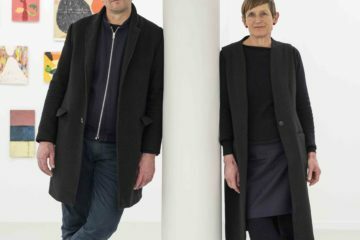 We were delighted to catch up with Winnie to talk further about her art practice and vision for future works. Read on! AMM: Hi Winnie! 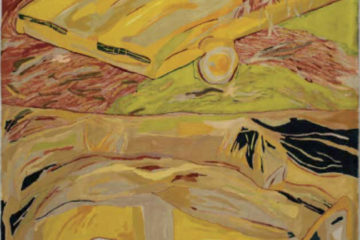 Could you tell us more about your artistic background and your first experience in art making? 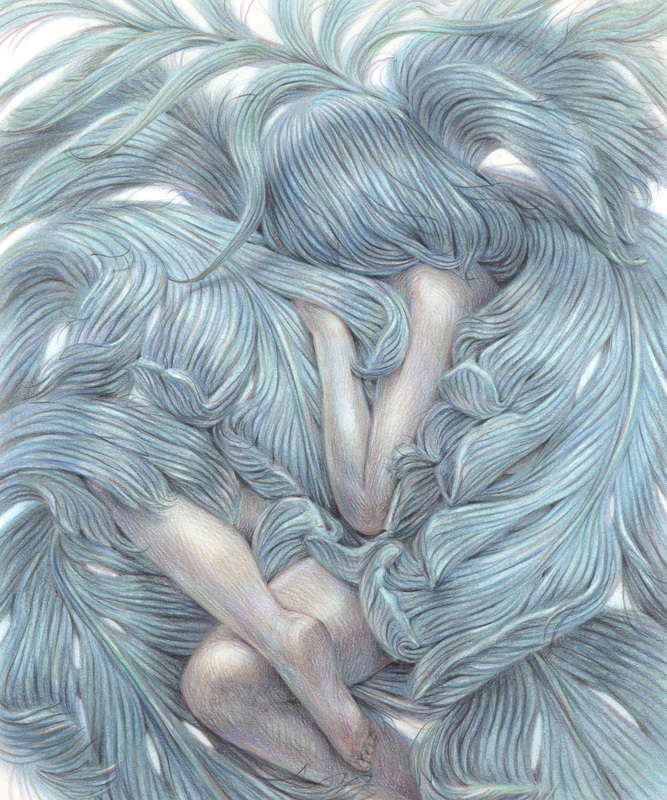 WT: I’m an artist based in Toronto working mainly with colored pencil drawings. I haven’t stopped exploring other avenues of mark making, most recently through paper cut collage work and animation. I’ve been interested in making things all my life. I was a part of a high school program that specialized in the arts. Going to school and getting a degree for drawing and painting was also an essential part of my development of a strong studio practice and community. AMM: You work with a very interesting technique combining paper cuts and drawings. What inspired you to work with this art medium? WT: It came about over a nomadic year working at different residencies. It was a solution to making work abroad in a compact way, travelling with a stack of 8.5”x11” sheets of toned paper with cut out elements to be arranged and applied upon returning to my regular studio in Toronto. It also came about as I’ve been looking at other means to create figures and environments, with greater depth. Working with cut paper was a way of bringing more dimensionality to the process and a greater play with layers and shadows. AMM: The female figures in your work look very mysterious and mesmerizing. They almost look like animalistic creatures grasped by the natural environment which you create around them. Could you describe the vision behind the scenes of your drawings? 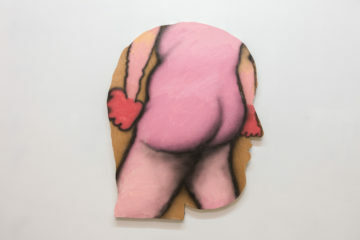 WT: From the beginning my practice has been rooted in a dialogue between the body, hair and the drawn line. Using only colored pencil and chalk pastels on paper, I’ve pursued those ongoing themes by continuing to examine our heavily coded ideas of beauty, nature and femininity through subverting the idealized female form. 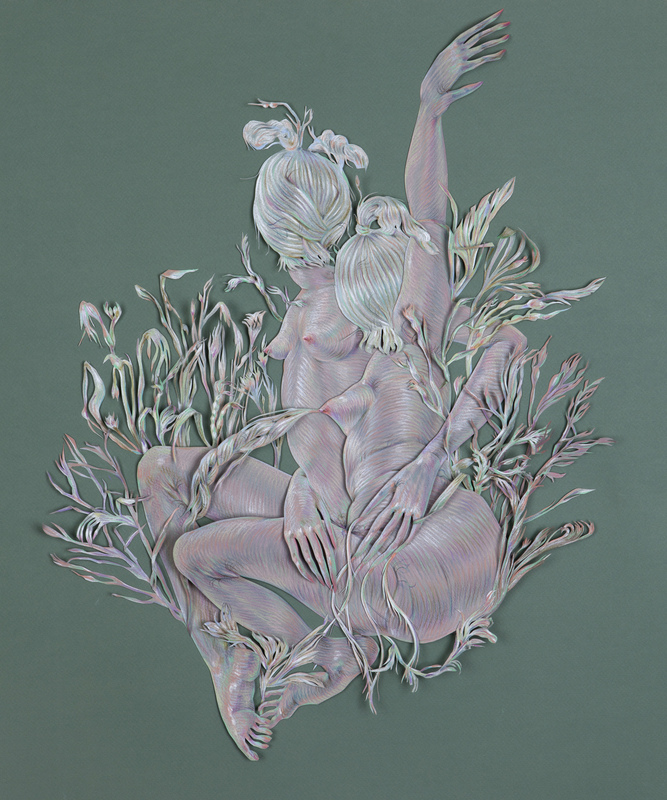 My most recent body of work titled Paper Cuts, embodies these ideals with a cast of female figures imagined as “Wimmin creatures”. They are more gestural and animalistic than my previous drawings on paper. 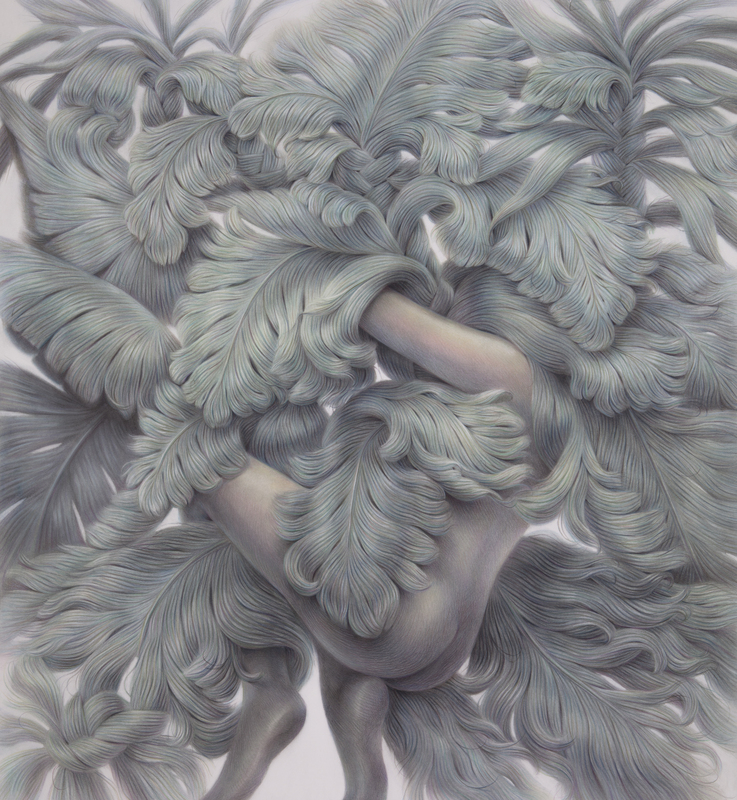 With this series, I’m more focused on capturing the environments of spontaneously emerging flora, fronds and tendrils that mingle and coalesce with the body’s flesh and folds than with rendering the flesh of the figure with precision. The narratives are inspired by relationship dynamics, personality tropes, and stories from the female experience. AMM: You have astonishing attention to detail. How long does it take to produce one drawing/papercut? WT: I would say each piece takes a few weeks to a month to do… My process with the paper cut drawings involves creating layers from elements using a process of meticulously hand cut paper that is folded, collaged and then drawn upon with colored pencils. I assemble and reassemble the subjects and environments because the pieces are flexible and interchangeable from work to work, I don’t commit to adhering anything until the end. The scenes are ever-changing, there are so many possible shifts before the final work is set. AMM: Why did you prefer a color palette of greens, blues, violet and pink as reflected in your work? WT: As much as I want to inject greater color variation and contrasts, the palette works itself instinctively as my own response to the time and place and mood involved with making the work. 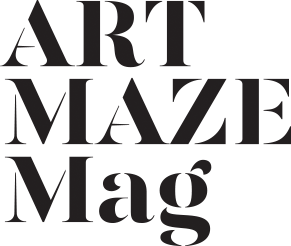 AMM: If you were to try a totally different art medium — which one would you pick and what would you create? WT: At the end of the day drawing is at the core of my practice and is the method of making that I am most drawn to. However, I am always reinvigorated by the different ways my mark making can be interpreted. Recently, I’ve given life to these cut paper subjects through a blend of stop-motion and digital animation. Another project I’ve been working on is a collaboration with Berkeley California based ceramicist Luvhaus on a series of vessels I’ve created original drawings for with a special glaze pencil. WT: Someone who enjoys drawing on her days off.